Understanding bird courtship can help birders better appreciate the challenges birds face in finding the best mates to raise the next generation. From mating dances, crazy poses, and nest building to other elaborate displays, this behavior can be fascinating to witness. When birders recognize courting birds, they can be sure to avoid disturbing these delicate rituals. The ultimate purpose of courtship is to attract a receptive mate, but there are several other purposes behind the courtship behavior of different bird species. The intricate moves of a mating dance and the charming songs used to woo partners can help distinguish species so birds are sure to choose genetically compatible mates. Different courtship behaviors also reduce territorial aggression, letting two birds relax together to form a pair bond. Depending on the behavior, how birds react in courtship can also display strength, health, intelligence, and mating desirability. This allows different birds to choose the best partners and ensure viable, healthy offspring. 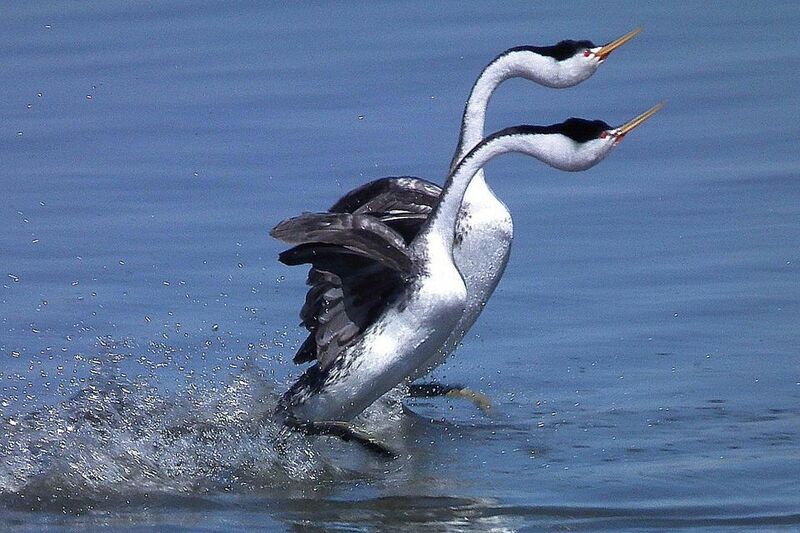 There are several different courtship rituals birds use for finding a mate. Most species will use one method overwhelmingly but may actually have several methods they use to lesser degrees. The exact type of courtship can vary greatly between different species, and even birds of the same species may have slightly different courtship variations in different regions. Singing: Singing is one of the most common ways birds attract mates. The song's intricacy or the variety of different songs one bird can produce help advertise its maturity and intelligence, highly desirable characteristics for a healthy mate. Singing can also define the boundaries of one bird’s territory, warning off weaker competition. For some species, only one gender (usually males) will sing, while other species may create a duet as part of their bonding ritual. Displays: Flamboyant plumage colors and elaborate displays of prominent feathers, skin sacs, or body shape can show off how strong and healthy a bird is, advertising its suitability as a mate. Peafowl are one of the best-known species for their stunning display with the males’ extensive, colorful fan. Other birds may use subtle changes in posture to show off their plumage to the best effect, such as raising a crest, hunching their shoulders, or flaring their wings. Dancing: Physical movements, from daring dives to intricate sequences including wing flaps, head dips, bill rubbing, or different steps can be part of a courtship ritual. In many species, the male alone will dance for his female while she observes his actions, while in other species both partners interact with one another. Mistakes in the dance show inexperience, weakness, or hesitancy and would not likely lead to a successful mating. Preening: Close contact between male and female birds can be part of the courtship rituals to help diffuse their normal spatial boundaries and aggression. The birds may lightly preen one another, sit with their bodies touching, or otherwise lean on one another to show that they are not intending to harm their partner. Feeding: Offering food is another common part of courtship for many birds. A male bird may bring a morsel to the female, demonstrating that he is able not only to find food but also that he can share it and provide for her while she incubates eggs or tends chicks. For some species, the male may bring food and leave it nearby for her to eat. In other species, he will place a seed or insect directly in her mouth just as he might be expected to do when helping feed hungry nestlings. Building: Some birds attract a mate by showing off their architectural skills. Constructing nests before the female arrives is a way for males to claim territory and show the suitable nesting areas they can defend. They may also decorate the nest with pebbles, moss, flowers, or even litter to make it more eye-catching. The female may then choose the nest she prefers, or she may still build her own after mating with her chosen male. It can be amazing for birders to witness delicate and intricate courtship rituals, but it is important that those rituals not be disturbed. Attracting mates is a demanding process, and any disruption could harm a pair bond and cause the birds to abandon their efforts. If mating is interrupted, the birds may ultimately choose less suitable partners or not mate at all. Birders should keep their distance and remain as unobtrusive as possible if they notice any signs of courtship behavior or pair bonding in the birds they see. Just observing and understanding bird courtship, however, can help birders better appreciate the complexity of the avian relationships forming in their backyard.